As Southern California’s leading commercial HVAC service provider, Cutting Edge Services, Inc. installs the highest-performing, most cost-effective green HVAC systems available on the market today. What is a “Green HVAC” system? Simply put, a green HVAC system takes the individual variables of each job into consideration, rather than build a cookie-cutter system that may expend too much energy, increase costs, and work inefficiently. During the planning stage of your project, our engineers review local climate and building designs, calculate room and building size, and take a look at insulation, window placement, duct placement, and even building orientation, as well as many other components. Then our engineers design a green HVAC system that is tailored to your specific needs. This approach also makes installation easier and more efficient, and reduces labor costs. Comfort of occupants: Your employees are more comfortable in the thermal environment and thus more productive. Less noise and disruption from equipment: The acoustics of your building are protected. Money well spent: Your capital investment retains the majority of its value over time. Fact: If you have an HVAC system that is more than 10 years old, you’re consuming as much as 25% more energy than you need to be. By installing a green HVAC system, you will lower your company’s energy costs, optimize your equipment efficiency, reduce your carbon footprint, and help reduce our country’s dependence on fossil fuels. Call us today: 310-344-8817. If you’re designing, installing or maintaining a clean room, your HVAC is your top priorities. For over 20 years, Cutting Edge Services, Inc. has provided this service to companies throughout Los Angeles, San Diego, Orange County and the Inland Empire. We work with a number of industries including health care, aerospace, pharmaceuticals and manufacturing. We’ve become leaders in the field. Here’s some clean rooms tips we’d like to share with you. When seeking HVAC solutions, remember that keeping your clean room free of contaminants is as important as comfort level for your employees. If you have a clean room, you must continually be aware of changes that can alter the level of contaminants that can affect your product. These issues need to be considered so we can help you attain the most effective contamination control program. Future growth: Your business may grow and add staff members. More people—and their skin flakes, hair, fingertip oils and body heat—will increase the chance of particulates in the air as well as increase the overall room temperature. By working with your growth projections, we know which solutions to offer. Uniforms and accessories: Clean room employees typically wear special gear, which can include jumpsuits, gloves, facemasks, gloves, head coverings, and goggles. This attire creates potential discomfort to your staff—and leads to decreased production—if the clean room is not well cooled. This is important to consider when planning your clean room HVAC system. Air conditioner filters: HEPA (High Efficiency Particulate Air Filter) filter particles that are invisible to the naked eye. When considering your particular clean room situation, we determine the size and placement and replacement schedule for HEPA filters that will provide the most particle collection. Filtration: In addition to the HEPA filters commonly used in cleanrooms, there are a number of other air conditioner filters used to remove particles. We’re the experts. We’ll help you design your clean room so that it meets or surpasses your industry’s regulations and standards. From air conditioner filters to pressurization, temperature, and humidity controls, we’ll advise you on the proper HVAC system for your clean room and whether it’s OK for you to use your existing system or something more specialized. Call us today for information about installing an HVAC system in your clean room. How long will it take to get HVAC service? At Cutting Edge Services, Inc., we understand that when your HVAC systems fail, it affects your productivity. So when you need fast and reliable heating or AC repair service from our highly trained techs, we are there for you. We cover all of southern California, from the north edge of Los Angeles to the San Diego border, and throughout the Inland Empire. When you call us, we send a tech out to your location within 48 hours. 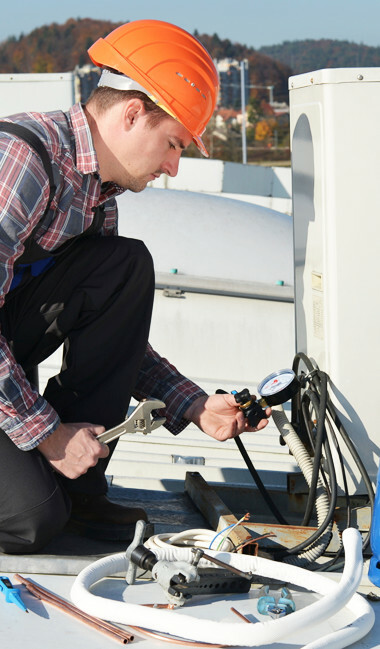 Once our tech arrives at your office, the tech diagnoses your HVAC system issue right away. Need AC repair service? Our tech can instantly access the tools and parts needed to make your AC system work the way it is suppose to. Heating issue? Same deal. An overall HVAC system failure? Our techs have access to the resources to fix your problem in a timely manner. Are you a monthly Maintenance Program customer? If you’re one of our Maintenance Program customers, you go to the head of the line. We’ll be there on the same day—within the hour, if possible. Our AC repair service and heating repair service quickly ensures your office environment gets back to normal so that your employees will be more productive. Our Monthly Maintenance Programs are designed to make sure you aren’t faced with an HVAC system emergency. They are designed to address the specific needs of your organization.